Colorful rainbows are the perfect way to introduce all things spring to little learners! 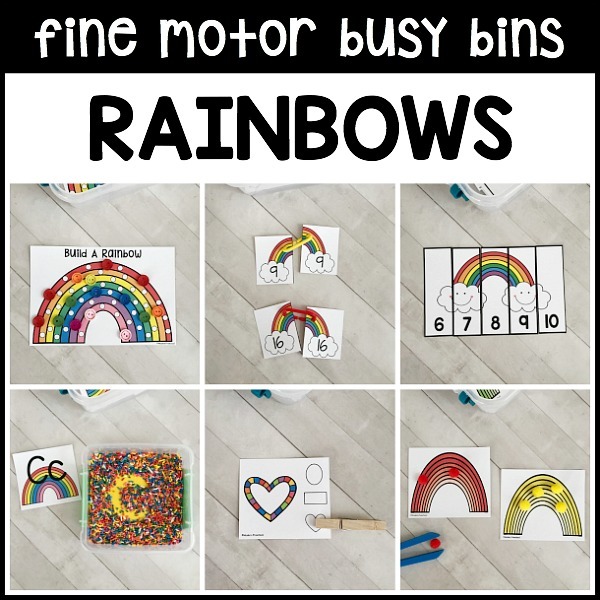 Our printable RAINBOWS Fine Motor Busy Bins for spring and St. Patricks Day are the perfect addition to your classroom. 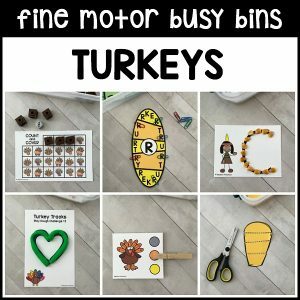 The RAINBOWS Fine Motor Busy Bins include 12 printable activities that offer fine motor practice for little hands. 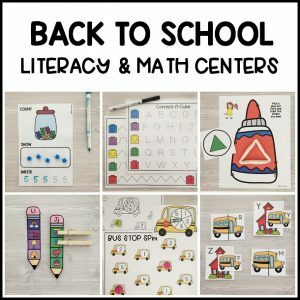 Fine motor practice is needed to be ready to cut with scissors, hold pencils the correct way, buttoning jackets, opening lunch boxes, and tying shoes! 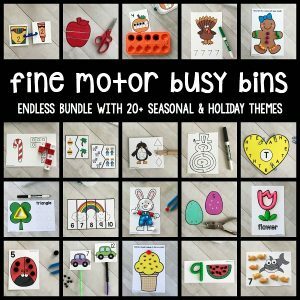 The RAINBOWS fine motor busy bins are the 11th set in our ENDLESS Themed Fine Motor Busy Bins Bundle. Find details about the Rainbows Fine Motor Busy Bins for spring and St. Patricks Day activity descriptions and extra supply lists can be found below. Check out the images above to see the busy bins in action. Pom Pom Rainbows – Sort colored pom poms on the correct colored rainbow using kid-friendly squeezers. 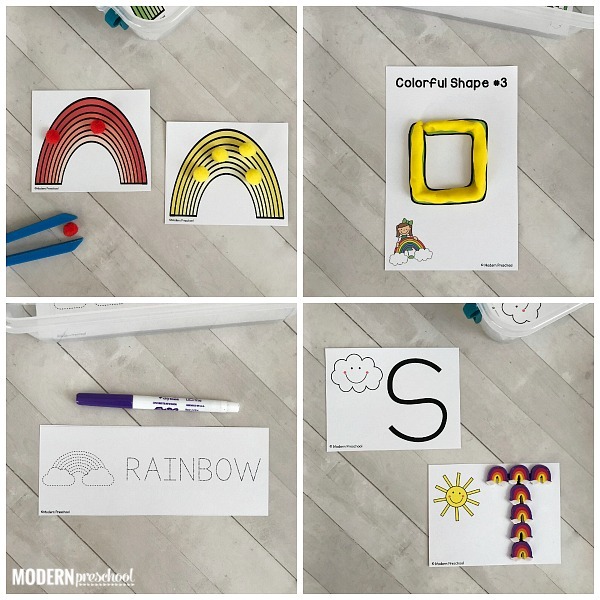 Rainbow Covered Letters – Trace uppercase letters with rainbow mini erasers to practice letter formation and recognition. 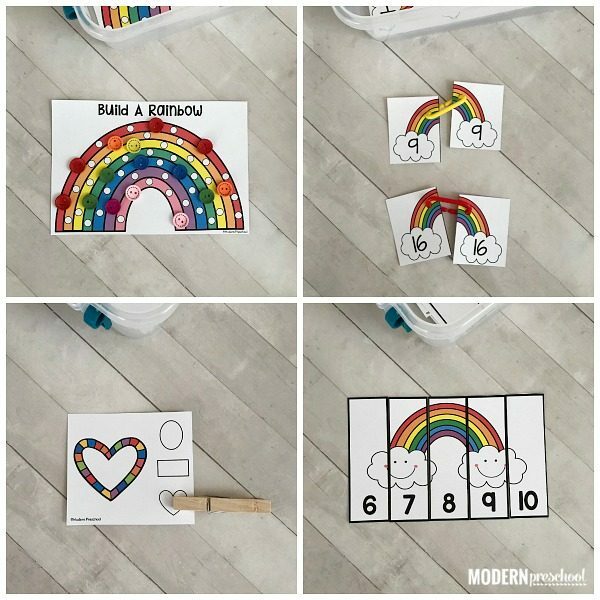 Linking Number Rainbows – Match the numbers 1-20 together to complete the rainbow while using plastic chain links or a pipe cleaner. Rainbow Color Magnet Words – Practice building letters in color words with magnets. Use uppercase or lowercase magnets depending on learning level. Rainbow Shape Clip Cards – Identify the rainbow shape on the card and clip a clothespin on the matching shape. 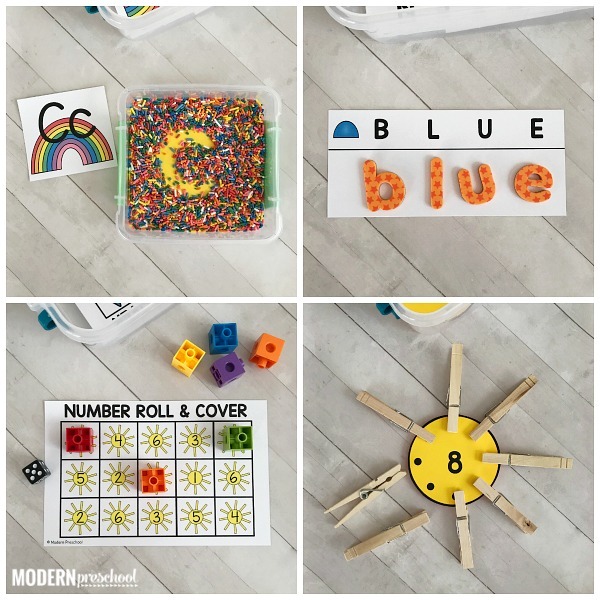 Rainbow Letter Writing Tray – Write uppercase and lowercase letters in sprinkles to work on letter formation in a super fun way. Colorful Play Dough Shapes – Form play dough into the shape on the card. 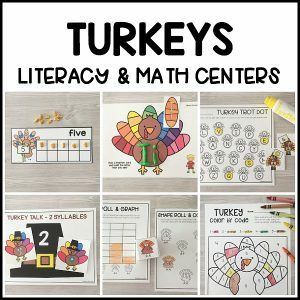 Use the card as a play dough tracer or build the shape on the table. Build a Rainbow – Cover each dot on the rainbow with the correct colored button. Fill in the rainbow entire rainbow! Number Suns Counting Cards – Identify the number on the sun and count the dots. Place a clothespin on each dot to add the correct amount of sunshine rays. Rainbow Tracing Cards – Trace different rainbows and words in colorful dry erase markers. Number Roll & Cover – Roll a die, identify the number, and cover the matching number with a snap cube. Use dice with number 1-6 or 7-12. 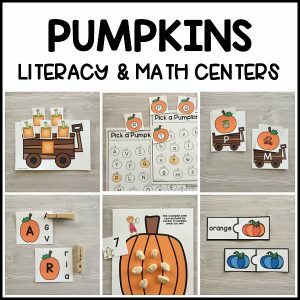 Number Puzzles – Put the puzzles together using number order while matching the pictures in the puzzle pieces back together correctly. Don’t stop here! 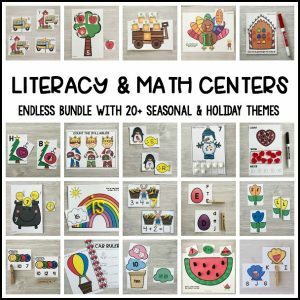 Our RAINBOWS Literacy & Math Centers go hand-in-hand with these Rainbows Fine Motor Busy Bins.